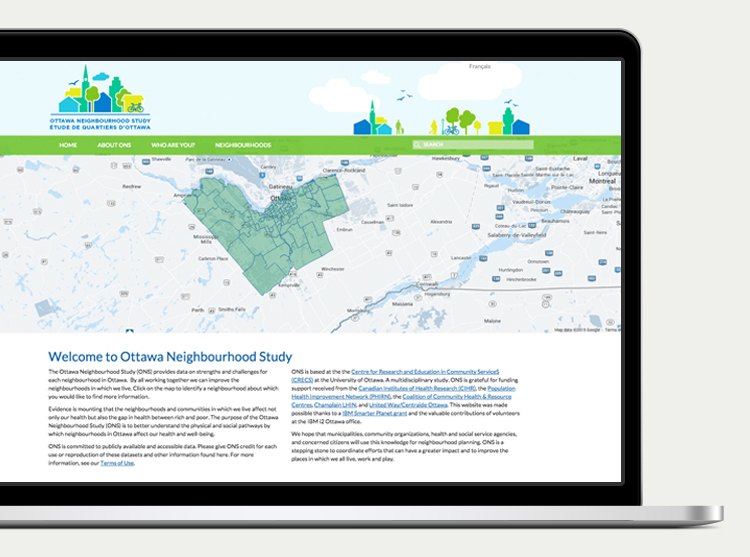 The Ottawa Neighbourhood Study (ONS) is a website that presents data on the strengths and weaknesses of neighborhoods throughout Ottawa. In 2014 the website’s security was comprised and was hacked, and with some of the site functionality lost ONS turned to Industrial to recreate some of the lost features as well as make some improvements to the population and presentation of data. Along with the upgrades to features, ONS also requested updates to the visual design of the website, to be more modern and responsive. A key update to the website was in the neighbourhood profile tables. There was previously no easy way the profile data for neighborhoods to be updated and kept current. As a result, any changes or improvements to the data set was a long process and the data frequently became out of date. Industrial’s primary goal in the website enhancements was to improve the integration between the data source and the WordPress website. The data was housed in Google Fusion Tables, used by ONS to update the information neighbourhood data. Industrial built a series of scripts that could be run through the WordPress interface which would pull in data from Google Fusion Tables. This data was then used to populate the Neighbourhood profile tables across the website. The second major focus of development was to improve the usability of the neighborhood maps. Industrial looked at the current challenges and potential improvements with the map system, and made several enhancements to allow the data to be consumed more easily by the end user. In addition, Industrial made changes to the neighbourhood maps to fix issues with the French versions not being in sync with their English counterparts. Finally, Industrial worked with ONS to develop an updated website interface. The WordPress site was redesigned with a new look and feel which was more modern and responsive. The design concept was provided to Industrial by ONS, and Industrial built the updated user interface based on these mockups. The ends result was a better integration wih many of the key functional pieces of the website (such as the neighborhood maps). With the major enhancements done for the Ottawa Neighbourhood Study, Industrial was able to launch the changes in time for an increase in media attention. Very shortly after the updates were pushed live, the Neighbourhood Study website was featured in an article for the Ottawa Citizen and website traffic increased. The enhancements and fixes to usability problems made for a much better experience for new visitors finding the site through this positive press. 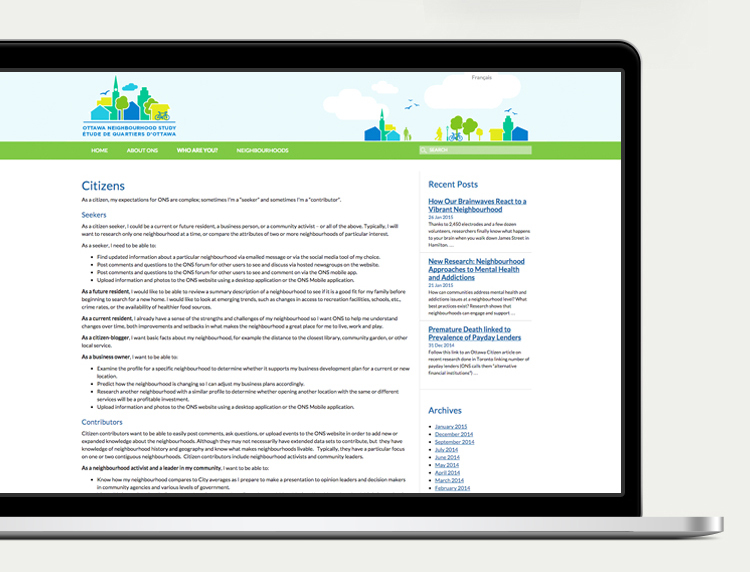 After creating a more stable and updated web experience, Industrial has remained an important partner to the Ottawa Neighbourhood Study. By continuing to provide feature enhancements and technical support, Industrial is helping ONS remain a leader in research and open data. 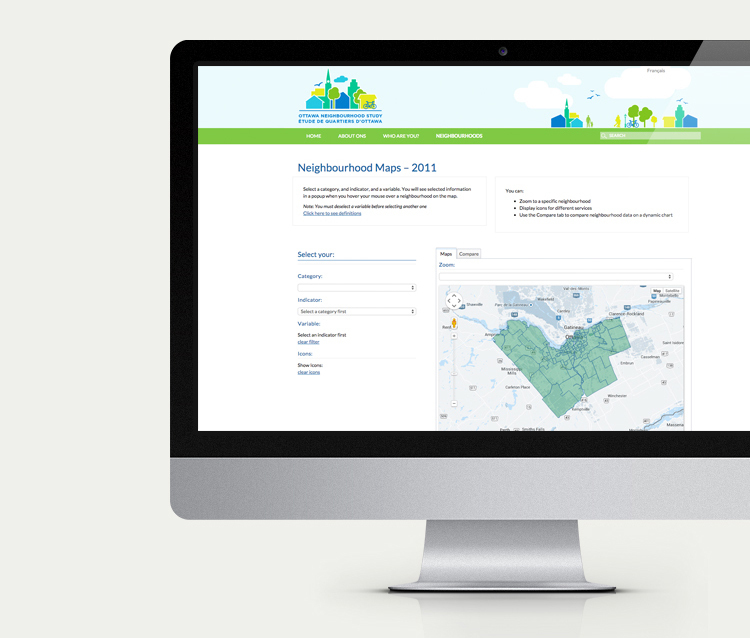 The Ottawa Neighbourhood Study (ONS) provides data on strengths and challenges for each neighbourhood in Ottawa. By obtaining regional information and making it publicly available, ONS acts as a key supporter for the Open Data movement.